@DAIICHI congrats Darwinex on the social media Twitter. It's a joke (un gag en français). $GAG promising ? Darwinex ! Are you serious ? 1,1/10 on Loss Aversion !!!! Yes ! It's very promising. Pfff poor filters algo. I pray for your investors; they've been rouled out by your capacity to prettify the reality. In theorie you're un champion, in practice far less. Capacity (the score) is an simple and simplist ESTIMATION. One the real divergence is important for investment. But, thx for your prays. I don't understand your notation of Cp ! Between the "SHOULD be able" and the "ESTIMATED" divergence, how do you score ? In example, the darwin GAG and $FAX. For the same period (All, 6M, 3M), the same estimated MAX investment...$GAG diverges negatively as of -0.5pips whereas $FAX diverges as of -1 pips for a better return. 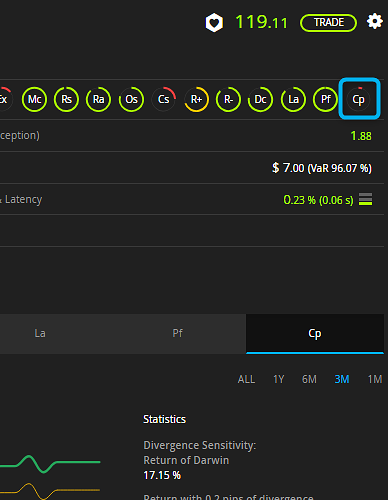 Why $FAX has a poor score < 1/10 Cp ? For me, Capacity is a fake attibute for the strategy which trades only EurUsd on intraday (out of scalping). I am in a hurry to have a million on $FAX to see the true divergence! LOL there are many things that you don't understand. I'm not going to loose my time to explain. Pfff, and why do you read of throught ? 2- $GAG & $FAX have For the same period (All, 6M, 3M), the same estimated MAX investment. Do you have other important question cavalier ? LOL I don't pray for the divergence but for investors money. You're welcome if you have any other question. Seriously @CavaliereVerde, you have the power of live and death on this community ! 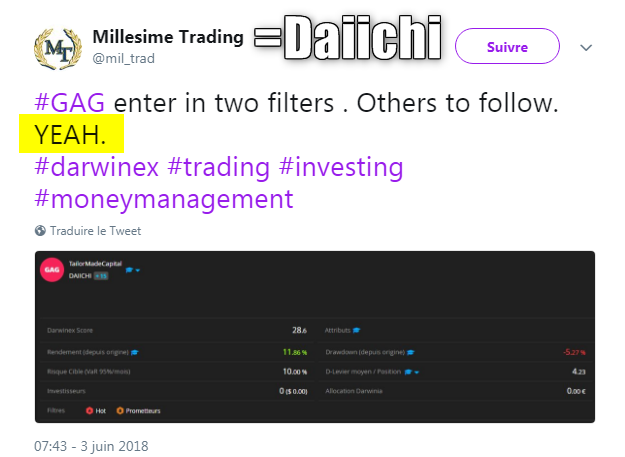 Sorry for that @daiichi. @CavaliereVerde i criticize the Promising filter of darwinex not $GAG, the poor, it's not himself who give this filter. 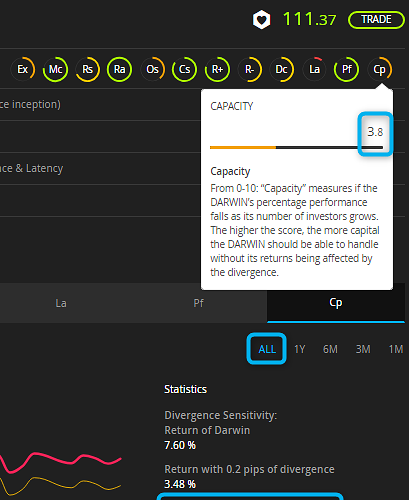 With a 1,1/10 on Loss Aversion (La), how darwinex ? Pfff their algo are really busy for filter. LA is important but not as important as you think. If a bad trader with so many darwins closed can earn a filter anybody can do it, isn't it? versus in the right corner, the on fire $FAX, showing One trade at the same time, at the same risk, the King OoOoOf Loss Aversion. who will manage his drawdown in time and in-depth ? who will be with the carpet? I'm wondering why @TheCheetah is not publishing today. Oh non he has made an loosing trade. I would love to see some graphics, they are so cute. Loss Aversion is just the risk/reward of trades. What really matters is loss aversion of the trader. Whe you are able to tolerate losing trades, losing days, losing weeks and losing months you are much closer to be a profitable trader.